At this point, it’s probably pretty clear that we really love the Ford Mustang and all the awesome things that it has to offer here at Miami Art Cars. We want you to get a Miami car rental that you’re not ashamed to drive – no one should be forced to drive an 85 horsepower Hyundai Accent with no air conditioning. Just because you’re visiting the Miami area with no car doesn’t mean your choices with a Miami car rental should be bland, slow and boring. 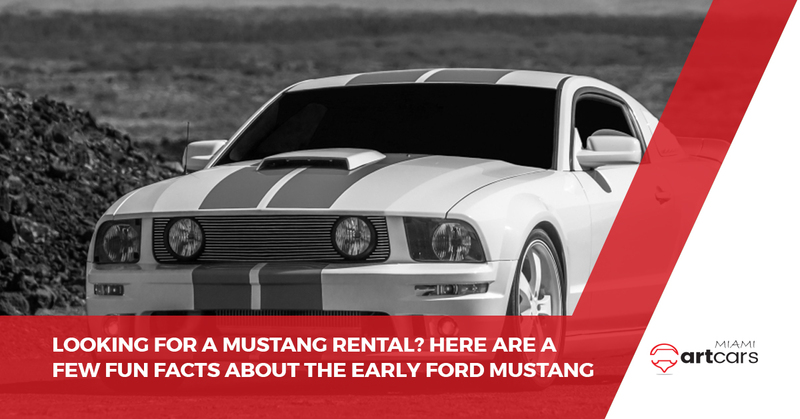 We provide Ford Mustang rentals because they’re quite the opposite of bland, slow and boring. We find that the Mustang offers a fun, great-looking and fast driving experience without paying the pretty penny of other high-end supercar rentals. With transmission options available in automatic or manual for those who want a truly authentic driving experience, there’s a budget sports car rental option for everyone here at Miami Art Cars. Today, we’re going to take a quick look at a few fun, lesser-known facts about the early Ford Mustang. In early sketches, the Mustang silhouette emblem always faced left. However, on Mustang models, the silhouette emblem on the grille always runs to the passenger side of the vehicle, whereas on the back of the vehicle the silhouette emblem is always positioned so that it runs toward the front of the car. It’s the small details that really count! In order to promote the then-recently-released original Ford Mustang, Ford themselves put a Mustang convertible on the roof of the Empire State Building on the eve of October 20, 1965. How was it possible to get a full-sized automobile on the roof of the Empire State Building, you ask? In order to achieve this feat, the engineers in Dearborn created a system to separate the Mustang into four sections so that it could fit in the building’s 7-foot-tall elevators. Well, the early Ford Mustang was released as a sort of remote control toy car, technically. At the low price of just $4.95, the 1966 Ford Mustang GT hit the bustling mid-1960’s consumer market just in time for Christmas. The electric toy Mustang was available exclusively at Ford dealers when it was released, and the mini-Stang included steerable front wheels, working head and taillamps, and a V8 under the hood that simulated the real thing. Plus, batteries were included, so it’s pretty easy to see why this toy Mustang was such a hit. The new Mustang is here to carry on the Ford sports car legend, and Miami Art Cars has what you need to get hooked up with the latest Mustang rental. Not a huge Mustang fan? No worries! Our sports car rental, monthly car rental, and airport car rental services can get you set up with a personalized Miami car rental that is tailored to your needs and wants. Plus, Miami Art Cars also offers special delivery service, concierge assistance and more to enhance your driving experience. Why drive around in a car that you hate when you don’t have to? Contact us today to cruise around in the ride of your dreams.